Here we have a very detailed account of the Allen-Betty courtship, written just after the wedding. A self-confessed “old maid”…a widower who though love was over…a marriage that started out as a game and ended up for keeps! 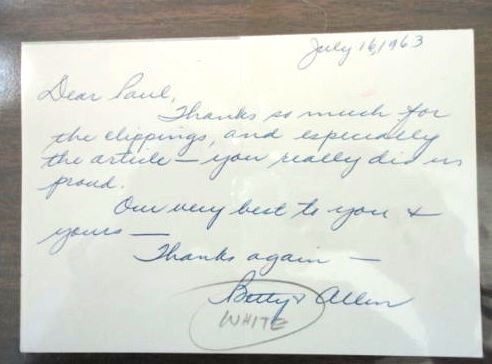 A thank-you note written to the author, Paul Denis, presumably regarding this very article, is listed on eBay at the moment (with a minimum bid of $699.95 — ouch!). Betty seems very pleased with the job he did!